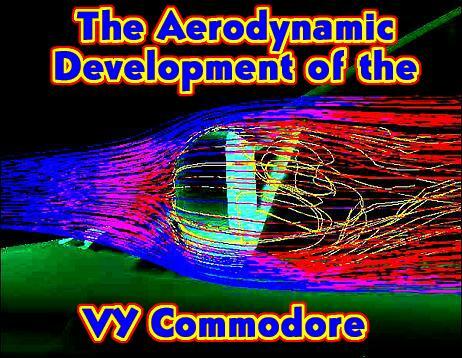 In this final part in our two-article series on the VY Commodore's aerodynamics, we talk to Holden aero engineers about the new design mirrors, find out how wind noise was reduced from the wipers - and touch upon the aero design of the next all-new Commodore. Much of the effort on the VY's revised aerodynamics was invested in the new design external mirrors and the body shape around the wipers. The primary goal was a reduction in wind noise. "When you're driving with the window down, even at 60 kays, you can hear a lot of noise from the VX and VT mirrors," said Senior NVH Engineer, Christian Peric. "We had to look inside the cavity of the mirror to see what generates that interaction between the cavity and the lens. We then made some changes to reduce that noise - when you're popping around town with the window down you shouldn't [in VY] hear the mirror at all." Optimising the mirror shape revolved around studying the airflow pattern over the shape, and aero-acoustic sound measurements made inside the car. Rather than using smoke or wool tufts in the wind tunnel, to see the airflow pattern the engineers took a very simple approach (one that would also be very effective in DIY on-road aero testing). They brushed a clay/water mix over the areas of interest, then started the wind tunnel fan. The flows of the water showed where the air was moving, and as the water dried, the clay particles leave behind a chalky film recording the pattern of flow. About ten completely different mirror designs were trialled, but also present in the wind tunnel was a clay stylist making minor on-going shape modifications - so the total number of different tweaks tested was much higher than this. Christian Peric: "We wanted to make sure that (a) the wind noise went down, (b) the drag stayed the same or preferably got better, (c) that the mirror was makeable, and finally, that it looked OK. That process had to happen concurrently, with everyone in the team in there at the same time." "Effectively what we are looking at is mid to high frequencies, where you get whistles, cavity noise and general mirror rush. We were trying to do two things: slow the velocity down past the side glass - that directly correlates with sound pressure level to the power of six - and make the wake as small as you can." Adds Dean Niclasen, "There are two things that you are trying to achieve when you first do the CFD design of the mirror. One is - as we've said - to minimise the velocity. But the other is to direct the wake down below the beltline of the car, so the wake when it reattaches to the side of the car doesn't attach to the glass but [instead] attaches to the sheetmetal of the door. Clearly the transmission of noise through the window is much worse - and closer to the person's ear - than if it's on the door." When compared with the previous model VX mirror, the VY mirror (measured at 120 km/h with the window down) is up to 12dB quieter at 500Hz and noticeably quieter right across the 20 - 10,000Hz range. The cowl area around the wipers has also been remodelled for the VY, a continuation of a fix for a problem that became audible in the last stages of the VT development. Christian Peric: "If you look at a VT-VX you'll see two lumps on the plenum, designed to deflect air over the wipers. That was a reasonably late change in the VT because of wind noise - we recognised that and had to make that decision. But for VY we actually had the opportunity to make a properly designed plenum to actually deflect air nice and cleanly over the wipers." But what's this about deflecting air over exposed wipers, where for decades there have been cars built that conceal the wipers below the bonnet line? Why doesn't the VY Commodore do that? The three engineers answer the question simultaneously: "Cost!" Dean Nicalasen then adds, "The cost is driven by the fact that if you have a wiper that parks beneath [the bonnet line], you have to have a separate park position. The wiper mechanism has to be far more complex to be able to go from a parked position to its range of motion, and then park itself again. It's just cost." But surely the extra cost would be trivial? Maybe even a dollar per car? "We make 120,000 cars a year. If you put one dollar cost into every car, and you can't increase the price that we sell the car for by that one dollar, then that's $120,000 off the profit of Holden for the year. You don't need to do that many times and you've made significant inroads into the profitability of the company. So yes, each dollar is hugely important." So, stuck with altering the shape of the plenum and living with the exposed wipers (on this model at least - we bet the clean-sheet next model Commodore will have concealed wipers! ), what was the aim of the revised plenum shape? Christian Peric: "We basically tried to deflect the air over the wipers cleanly; to have them sit inside a separation bubble, and make that bubble as small as you can - you don't want to lose drag. The reattachment line is at the bottom of the windscreen, just above the wiper." "We did a lot of this work in CFD," said Dean Nicalsen. "The objective from a styling perspective was to make that little ramp as unobtrusive as possible, so there was a lot of push to try to get it to its optimum in terms of just enough [for the air] to get over the wipers and still stay as small as possible." The results can be seen in this graph - the VY produces a noise very similar to the VT with its wipers completely removed! For the engineers that were gathered around the conference table, the aero changes to the VY were literally old news - they are now deeply immersed in the aerodynamic design of the next new-shape Commodore, a car which can have a far more radical aero package than those changes able to be made in just a mid-model tweak. So how good is the aero going to be of the new model? Engineering Manager Peter Vawdrey: "The constraints on that car that have been imposed on us by changes in government legislation are going to change the whole balancing act to a significant degree. The pressures are on us to design a car that when it hits a pedestrian the injury to the pedestrian is going to be substantially less. That has a major impact on the styling of the car. "The government has a fuel economy objective for 2010 that if we do nothing to the big cars in Australia and we have to comply with these fuel economy targets - everybody will be driving Barinas. These are some major legislative constraints. Fuel economy is a top priority for our next car so we are looking at everything that will influence that - and aerodynamics will be a priority." That priority is being emphasised by a new-for-Holden approach to designing-in aerodynamics at an early stage. "VY was the first step," says Christian Peric. "It was an attempt at a completely new process as far as aero was concerned. We started with the design guys, seeing what they were thinking. Then we built a small scale model, we built a full-scale mock-up, and then we actually went in and validated it in sheet metal. That process was the first real forward cycle attempt [at optimising aerodynamics] and we're going through the same cycle again with the all-new car, with fuel economy being a strong focus." For 'fuel economy' read 'low drag co-efficient', with our expectation being that the all-new car will have a drag co-efficient as much as 20 per cent lower than the VY. That would spell a Cd of about 0.26! But to an extent the engineers don't get too hung up on Cd numbers. "In the new vehicle we don't have an aerodynamics target for its own sake," says Dean Niclasen. "We have an aerodynamics target that supports a fuel economy target, and that's what we are really working to. That's what the customer wants - the Australian market doesn't buy cars because it's got a great drag co-efficient. It's not a marketable figure. From an engineering perspective it's to support a fuel economy target - and that sells cars." It's likely that the new car will be helped in achieving this very slippery target with the fitment of a full-length flat undertray. "Certain things are on the table depending on where you are in the model cycle", said Peter Vawdrey. "Changing the complete aerodynamics of the undercarriage of the car for VY wasn't an option because the architecture was [already] there. But when you do a new car, the opportunity is there again to have a look at everything."